Inertia can be defined as the tendency to do nothing or remain unchanged. It is a state that usually creeps in on us particularly when we see a task as daunting, or after we just acquired a huge feat, and trying to get into another task before us. It is state that keeps one in a state of helplessness and joblessness, particularly when you need to get up and keep moving. You realize you can’t move or get out of that state, and time keeps moving so fast that you can’t help it. Inertia is so horrible that it could rob you of the time you should have spent judiciously or even rob you of opportunities which you should have targeted or met strategically. Tasks which you should have done by spending a good part of the time allocated for it, gets done in a hurry because a huge part of the time was spent in a state of inertia and the rest of the time left was not enough to do a thorough job, so it gets done in a wishy-washy way which could end up being a disaster or portray you or your work in a bad light. Inertia has made people to go late for job interviews, and miss important appointments which could have ended up changing their lives for good. 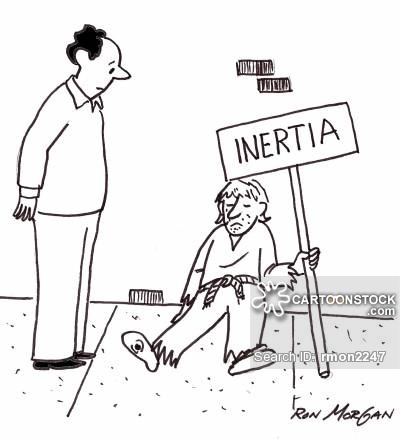 One of the ways to conquer inertia is not to feed it. I remember when I was writing my book Motherhood and the Society, and I had set a target for myself that it was a first quarter project. February was about ending and I was still far behind. I was so sad, but I could not help myself or get out of that state of inertia. I would come on Facebook, scroll and scroll, read some posts which would upset me and further drive me into a state of inertia. I snapped out of these after two weeks of not making progress and time was flying fast. I deactivated my Facebook account, got bored and restless for that day. However, the second day I got out of the state of inertia, and I was able to continue writing. For that one week that I denied myself of social media activities, I was able to add a chapter to my book which further gave the book a more beautiful direction. Inertia is a dream killer, and one needs to be disciplined in order to conquer it. You need to set target for yourself, and sometimes view it as a matter of life and death in order to be able to snap out of inertia. Inertia is deadly and can rob you of great opportunities and visions. Do not let inertia get you. Please subscribe to my blog bellow, so you can receive my posts in your inbox.